When you select a contract, the View Details button in the Data Management section lets you view details of individual contracts for which you have collected data. The window displayed below is an example of the available details. A unique exchange identifier that includes all gateways regardless of the gateway flavor. 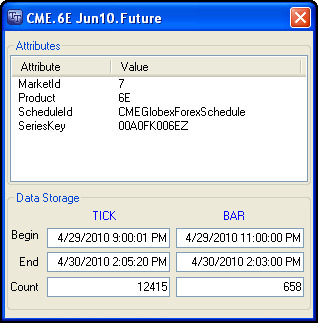 Example: 7 is the MarketId for CME, CME-A, and CME-B...etc. The product you are recording. The trade calendar schedule used for this contract. A unique identifier for each contract created by the gateway. When you began recording ticks and bars. When you last recorded a tick and a bar. The number of recorded ticks and bars.